Wow! Thanks for the neat stats. I'm fascinated. Danie, this is super interesting, thanks so much for "crunching!" (Excluding Alaska) The circle with a radius of 172.56km (107.22 miles) around N47 59.307 W106 39.206 (northeast Montana) contains no Earthcaches. These two caches are literally on opposite sides of the earth, less than 3km from the theoretical maximum, according to the earth model I’m using. Map of number of Earthcaches per country. Are the dots located on the centroid point of each nation? No, but I have removed them - they are confusing. Map of number of active Earthcaches per continent. North America: GC3PRZR - Caperton Swamp, or is it a Marsh? (U.S.A.):       50  "
Africa:        GC1BTDQ – Contorted Beds in Braamfontein    (South Africa): 15  "
Australasia:   GC28QZB – Mortimer’s Rift (Auckland)        (New Zealand):  15  "
Asia:          GC1D6JV – Permian Sediments                 (Hong Kong):     8  "
Latin America: GC3JHMB – Dolines                           (Brazil):        5  "
Middle East:   GC19A92 – Karnak Temple                     (Egypt):         4  "
Antarctica:    GC13ZJ3 – Antarctic Peninsula:                               1  "
Sorry about that - TargetMap appears to be down. Hopefully it will be restored. I find it interesting that the number of new ECs have been steadily decreasing since 2010. Why would that be? It is definitely not following the trend of the other cache types. Are we reaching saturation in Europe and the U.S.A., or is it more difficult to get a new EC published now? (My elevations are probably not 100% accurate - if you have more accurate elevations for some of these, please let me know). 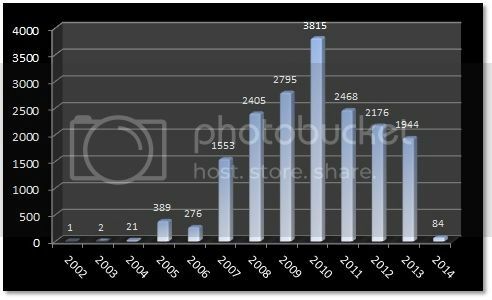 Number of EarthCaches published per year: I find it interesting that the number of new ECs have been steadily decreasing since 2010. Why would that be? It is definitely not following the trend of the other cache types. Are we reaching saturation in Europe and the U.S.A., or is it more difficult to get a new EC published now? I wonder if the decline has anything to do with the perception of the guidelines being restrictive - as discussed a lot on these forums? Danie - in the light of the above graph - could you compare the EC's growth / decline versus another cache type? I am not sure if you could - as you probably do not have the entire GC.com database? No, unfortunately I don't have the entire database. Just looking at the total number of caches however, it is obvious that at least the number of traditional caches is growing at a near exponential rate. My experience with the South African statistics shows the same thing - the number of new EarthCaches peaked in 2009/2010, and is currently only at about 60% of the peak number. I see we are celebrating 10 years of EarthCaches this year. I wonder why - according to my database the oldest EarthCaches are quite a bit older than that? Good question - I know that "4. GCHFT2 Earthcache I - a simple geology tour of Wasp Head: 2004-01-10" was the first Earthcache ever placed - it was placed by Gary (geoaware) - who started the program. I guess the others had earlier dates selected by the cache owner when the cache was placed. But #4 on your list is definitely and unequivocally the oldest Earthcache - no debate on that. But #4 on your list is definitely and unequivocally the oldest Earthcache - no debate on that. #1 has the word "Earthcache" in its title, the description contains a geology lesson (in other words the cache type is correct) and it has several find logs prior to 2004-01-10. Why does it not count? Danie - there was no "Earthcache" type - until Gary (geoaware) placed the GCHFT2 Earthcache I - a simple geology tour of Wasp Head in Australia. So anything prior to that could not have been an "official" Earthcache. Perhaps a prototype - or something else? Geoaware (or one of the other senior Earthcachers) may have a better explanation? This is awesome, and as expected, the stats raise some fun questions! a. Regarding the 2010 peak; I am not sure of the reasons for that, but a few quick guesses are saturation (in area and in topic), and guidelines that have admittedly gotten "stricter" around that time. The tighter guidelines may discourage some people from developing EarthCaches, while at the same time, reducing the number of submissions that actually get published. I wonder how much impact the changes on photo requirements had? Seems a lot of older EarthCaches relied heavily on the required photo, but since that was phased out, it became more difficult to create suitable logging tasks. Just thinking out loud. Also, since 2010, we've continued to add more and more reviewers, and I wonder if that has an impact as well. Back when there were fewer reviewers, maybe we were more inclined to say "good enough -- published!". But now, with more reviewers, each can take more time to ensure each cache fully meets the guidelines. Funny, I'd have thought more reviewers means more published caches, but I could see an argument for the opposite. But again this is total guesswork. Just "rationalizing"! Of course there is the saturation thing too. Although EarthCaching lacks the distance guidelines of traditional caches, there are limits on how many similar caches can appear in an area, so perhaps around 2010, we started reaching saturation of some types in some areas (erratics, waterfalls, springs, bogs, etc.). There's only so much geology to go around! I also wonder about the role of the Masters program. That program encourages people to develop their own caches. Maybe once so many people reached Masters status, they slowed down the rate at which they produced new EarthCaches? b. Regarding the EarthCaches that are older than Gary's, my guess is that they were published as some other cache type, then transitioned into an EarthCache type later on in their lives. I think I've seen a few other examples of these. I'm not sure if this is the explanation or not, but it's my initial guess. It looks like it started as a virtual, in which people learned a geology lesson and took geology readings to show they visited the location. Then later, after the official "EarthCache" type had been developed, this cache was converted to one. So, although we probably can't say it's the first (there are probably others out there too that were never converted), that cache looks like it's probably one of the first "proto-EarthCaches"! That's pretty awesome. For this cache: GCCE8D Tidal EarthCache, it looks like there was a log book as of 2005, but then eventually it was converted to an EarthCache, but I didn't see when, but by sometime in 2006. For the other one, GCGWVG Ancient Worm Trails, the CO logged this o 7/20/05: "The cache has been stolen. We are gogin to try and convert this cache to a virtual or maybe even an Earthcache. Stay tuned. In the mean time, if you want to log it, just post a picture of yourself or your gps by the rock." I would echo the saturation. People look for the easy grabs. Those are ones that are known locally, or highlighted in papers, parks etc. Those are mostly gone. Combine that with people that want you to just take a picture, and did not actually gather info at the site, or never got permission from someone. Sadly those caches end up not getting published. An example... There are lots of Yellowstone Geyser caches. Now to do one you need to find something unique to teach, that is much harder than the first couple. Not so sure I'd agree with the saturation as being the main driver. There are vast areas of the world where traditional caching is really growing fast - I think of Arabia as an example - but the earthcaching component has really not taken off - and there is AMAZING geological diversity there. Any caches that have developed have really been by a single individual. As an avid Earthcacher (and cache developer) - I have constantly spoken to cachers at various events around the world - and the perception is that the guidelines are restrictive and that there will be a lot of heartache to get an Earthcache published - so why bother. And there are generally anecdotes from cachers who support this with examples. The Masters Program is still in its infancy in these areas - so should show more growth here. I wonder if there is a breakdown of Earthcache Masters (Gary/Matt - could you provide this info in a database for Danie to analyse too????). So saturation may be a cause in parts of Europe and USA - but other places like Southern Europe, Africa, Oceania, Aisa - there are still huge expanses of untapped potential, which traditional cachers are exploiting. Most of these are minute countries with a single EarthCache, which is not really meaningful. To give you a feel for what this means - in Germany, if all the ECs were evenly distributed, they would be spaced 11.4km from each other, in the USA, 43.2km (26.9 miles) and the average for the world is 101.6km. The EC density in large parts of Europe is more than 10 times the density in the USA. I realize that interesting geology is not spread evenly, but with the possible exception of Western Europe, I doubt if we are even close to saturation anywhere else. Iceland, with its 70 active ECs and a population of only 322 000 gets the crown! Map of EarthCache density. The grey areas are countries with no ECs. This is great, and the explanations make sense. Maybe this has been discussed before, but what are some of the most popular earth caches, both in favorite points and most finds? Least amount of finds? I really like all the stats, keep them coming. what are some of the most popular earth caches, both in favorite points and most finds? Least amount of finds? The EarthCache with the farthest neighbour is GC3HXW9 - High noon in Kiribati - Rising sea & sinking land. Its nearest EC neighbour is 2305km away, in Samoa! Together they cover an area larger than Canada, about 8% of the earth's land area. In my experience the "most popular" earthcaches in terms of favourite points and resoundingly positive logs are rarely the better earthcaches in the real true earthcaching sense. Rather than being interesting geologically and educational, they tend to be at a touristy "wow" location (where the "wow" has little or no geological interest) and the tasks extremely easy with little or no educational value. I know that sounds super critical and negative and I actually don't mean to be, really, honest... It's just the reality of it - that the majority of geocachers don't judge an earthcache on earthcachey criteria. The circle with a radius of 1499.38km (931.87 miles) around N09 59.630 E21 08.303 (southeast Chad) contains no Earthcaches. It covers all of the Central African Republic, as well as large parts of Sudan, South Sudan, D.R.C., Congo, Cameroon, Nigeria and Chad. This is an area almost as large as Australia! The point N73 05.818 E122 13.354 (on the north coast of Russia) is the point in Asia that is the farthest from any EarthCache. The nearest two, Santa's Backyard (in Alaska) and Lake Baikal are 2499.74 km (1553.6 miles) away. Excluding islands, this is probably the land point farthest from any EarthCache. Reasons are bound to be multi-layered & agree with Matt's points. Combine also with "developer saturation" - I guess initial developers were mostly geologists who also ran out of new ideas/energy and now we have more amateur developers like me who take ages to develop each one. In my experience the new criteria improved the average quality EC. It's just the reality of it - that the majority of geocachers don't judge an earthcache on earthcachey criteria. The simple ones are gone. Everyone knows of the local landmarks. Nearly all of the locations highlighted by the local geology groups and rockbound groups have EarthCaches. So you can't pull up a simple website, get the answers then make a page. So in many areas (not all) you actually have to hunt for the information. If you are not a geologist you see something cool and go.. "huh, thats cool, I wish I know why it was like that" and you walk away. In other words, in many areas much of the simple stuff is gone. Second, the big drop in numbers was in January of 2011. That is when you had to actually have more than a photo. Well, you had to before that, but I think it hit home at that point. I have had a few people say that they don't want to go through the emails. They just wanted to look at the cache page. If there was no photo they deleted it. So it was a combination of not being able to come up with logging tasks, not wanting to police logs, and/or not wanting to deal with emails. Some areas just need that person to start looking and putting in the footwork. It is interesting that Germany, with considerably fewer EarthCaches (3421 vs. 6665), managed to log more finds than the US. Maybe a case of many people living nearby the average EarthCache? I think that's interesting, too. I think it might be a matter of cache density/ease of access. It's a looooong way between EarthCaches in a state like Montana, for instance. Montana is about the size of Germany, but it has far fewer EarthCaches. Is there any way to compare other like sizes of land areas--say the US states of Massachusetts, Rhode Island, Connecticut, and Delaware to Germany. I think that land area is about the same. Those states are relatively close to each other, too, and I tried to pick states I thought might be roughly as densely covered in EarthCaches as Germany. I'll see what I can do. But remember, the total number of finds for the WHOLE of the USA is less than the number of finds for Germany. If one compares only a part of the USA with Germany the difference will be even bigger. Or did I misunderstand you?